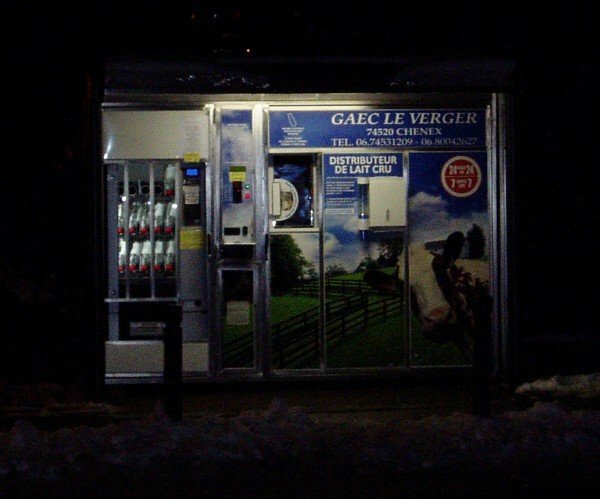 Illegal in many states, unpasteurized dairy is sold out of vending machines in Slovenia. Marko Bitenc gets more text messages than the average dairy farmer. Throughout the day, an app on his phone texts him updates on the quality of the raw milk in a vending machine down the road from the farm that he and his family operate just outside Ljubljana, Slovenia. Hoping to meet the cows whose unpasteurized milk I’ve been drinking for the last three months, I rode the bus to just a few stops shy of the end of the line one day in January. After hopping off at the outskirts of the country’s capital, it was a short walk past a small bakery and grocery store to the Bitenc farm. Across the street from the barn that houses the cows, I met the Bitencs at their home. Over glasses of apricot juice at their kitchen table, Marko and his wife, Monika, discussed the challenges of running a family-owned dairy farm and their decision to get into the growing business of mlekomats, as the vending machines are called in Slovene. The Bitenc farm’s machine is one of many that have appeared throughout the country in the last five years, all of which are owned and operated by local farmers. The system removes the corporate middleman, pleasing both farmer and customer. Thanks to the frequent texts Marko receives, the Bitencs knows immediately if the refrigerator stops working and the milk in their machine, which they change daily, rises above the temperature designated as safe by the Slovenian Administration for Food Safety. If this happens, the machine automatically stops vending, preventing the sale of unsafe milk. In spite of these strict precautions implemented by Slovenia, this kind of fresh, local convenience product is unimaginable in the U.S., where in many states the retail sale of unpasteurized milk remains illegal. The U.S. Food and Drug Administration has made its serious stance on raw milk clear in recent years through a series of dramatic raids targeting and prosecuting small farms and businesses that bypass pasteurization. Of particular concern to the FDA is the sale of raw milk across state lines, which has been outlawed since 1987. But beyond the unilateral illegality of cross-state sales, the confusing patchwork of laws at the state level makes it clear that our country is far from having a unified stance on unpasteurized milk, leaving the door open for an underground community of raw milk enthusiasts to thrive.